Bandleader and singer Micke Bjorklof founded Blue Strip with bass player Seppo Nuolikoski in 1991. After a few changes at the very start the line up has been the same for over fifteen years. They started as an acoustic blues/rock cover band but before long the roots & blues music and producing original material took over. Today the band is one of the most popular live acts in the roots & blues scene in Finland. They have stirred up audiences around Scandinavia and Europe with their energetic live shows wherever they play, from small clubs to big festival arenas. 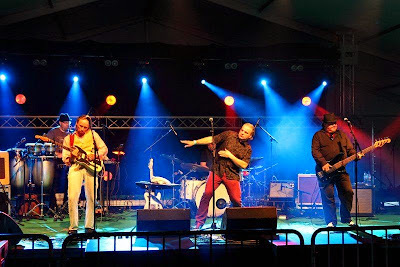 Opening shows for names like B.B King, FabulousThunderbirds, Little Feat, Bill Wyman Rhythm Kings, Solomon Burke, Robert Plant etc.” In 2007 Micke Bjorklof & Blue Strip finished up work on their latest release titled “Whole Nutha Thang”. The album was recorded in London, England with producer Neil Brockbank (Nick Lowe, Tanita Tikaram, Bryan Ferry). The album featured guest appearances by horn players Matt Holland and Martin Winning (Van Morrison, Lisa Stansfield) and magnificent keyboard player Geraint Watkins, known for his work with Paul McCartney, Bill Wyman, Van Morrison and Mark Knopfler.